The Secret of Cycling – Maximum Performance Gains Through Effective Power Metering and Training Analysis is the latest book of Guido Vroemen, Hans van Dijk and Ron van Megen. These authors also wrote two interesting book in Dutch “Het Geheim van Wielrennen” and “Hardlopen met Power!” that discuss training methodology and scientific models which estimate performance for cycling and running. Power Meters for cyclist do become more and more available for amateur cyclist (and not just for professional World Tour teams with a multi million dollar budget). For around EUR 800 you have a solid choice among different types and brands of power meters that can be installed on your bike. You can measure your own performance against professional athletes but chapter 30 of the book gives you 14 advantages why you should training with a power meter also when you are a recreational or amateur cyclist. Major trends as identified by Gartner Internet of Things (IoT), Smart Machines, Big Data & Cloud and Analytics have also become part of professional sports, and thus cycling. Predictive analytic- and performance models are becoming better available to the general public, while high quality analysis tools are available for a reasonable price as well (for example TrainingPeaks). Guido Vroemen, Hans van Dijk and Ron van Megen each with its different background have build an excellent body of knowledge that helps you or your coach understand the human engine and the physics of cycling under various conditions. Although clearly structured you can use the Chinese menu method to go through the book and read the chapters that are relevant for you. The Secret of Cycling is broken down in five big parts, that build theory layer by layer. The table below shows the Secret of Cycling book structure in a simple summary. Part I starts with explaining some basics of cycling with sports physiology, training principles, sports nutrition and training plans. Part II has a more scientific character where the physics of cycling are explained by understanding the concepts of energy and power, that combined with power requirements result in an overall cycling model. Part III is aimed and building knowledge around the power of the human engine. What is the functional threshold power and what is VO2 max and how is the relationship between these concepts. Is there a limit to the power output a human engine can produce? Al valid questions that are answered in part III. The biggest part of the Secret of Cycling is Part IV that tries to answer the question “How fast can you bike?” In the 45 chapters (!!!) of this book section a lot of influencing factors are discussed. You will see some of these factors in the Secret of Cycling Calculator. However you will read also about general training concepts, pacing strategy, nutrition. The last part of the book (part V) covers some of the myths of cycling, mainly focused on supplements, beet juice but also the impact of doping and vitamin D deficiency are discussed. Guido Vroemen, Hans van Dijk and Ron van Megen have done some cool predictions and analysis by using this calculator. Tom Dumoulin’s final time trial 100th Giro d’Italia where Tom took the overall victory in Milan. How well did Tom Dumoulin perform in the individual time trial at the 2016 Tour de France? The Secret of Cycling Calculator consists of three major building blocks, as you can see in the screenshot above. It is fun to be able to understand whats needed to deliver a certain performance and what contextual factors influence your cycling performance. For example what is the impact if you lose another kg of body weight when going uphill, what is the impact of of steady cadence on your overall power output. Okay, I’m considering myself as a serious cyclist, who is interested in understanding training data and improvements in performance. Guido Vroemen, Hans van Dijk and Ron van Megen will help you answer the following questions (and more) in a structured easy to understand format with the recurring example of “fast Eddy”. How much power does the human engine have? How much power do you need for cycling in different conditions? How can you optimize your training and racing performance? How can you use power meters to improve your results? What are the ultimate limits of human performance? 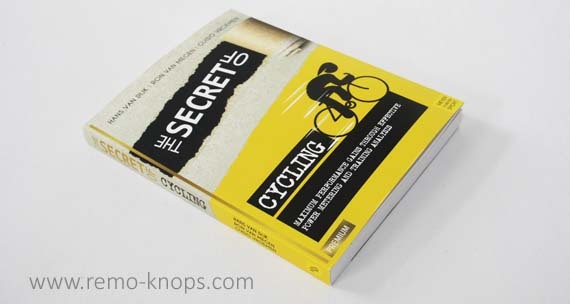 The book “The Secret of Cycling” is available for a price-point of roughly € 30,– where the Dutch version Het geheim van Wielrennen is slightly cheaper with a price-point of € 24,95. So if you are a native Dutch speaker you might want to save a few bucks. I would highly recommend the book The Secret of Cycling, because it gives you loads and loads of background and contextual information around the five main questions above. The expert knowledge and professional background of the authors, make this book truly valuable for serious cyclists and coaches. If Hunter Allen has written in the introduction that the authors are global experts, than you know you can’t go wrong with this book and its additional resources, like the calculator. P.S. Don’t forget to check out my other book reviews on my blog. Hunter Allen is a USA Cycling Level 1 coach and former professional cyclist. He is the coauthor of Training and Racing with a Power Meter and Cutting-Edge Cycling, co-developer of TrainingPeaks’ WKO software, and CEO and founder of Peaks Coaching Group. He and his coaches create custom training plans for all levels of athletes. 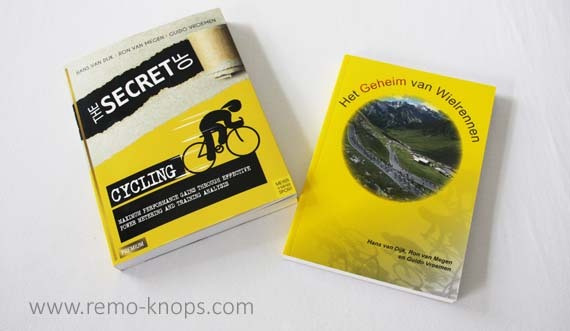 Hey!, I found this information for you: "The Secret of Cycling – Vroemen, Van Dijk, Van Megen". 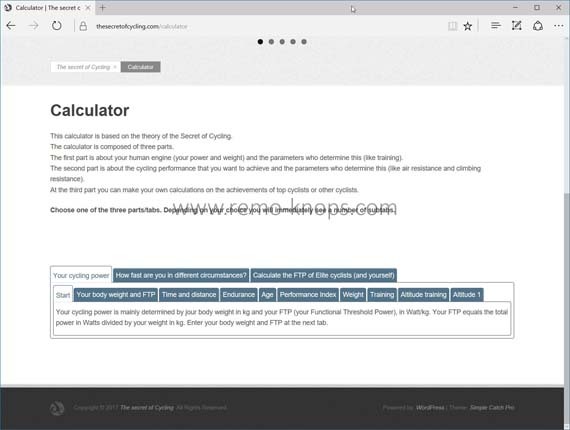 Here is the website link: https://www.remo-knops.com/5767/secret-of-cycling-peformance-power-meter-training-analysis/. Thank you.